A surface-to-air missile (SAM), or ground-to-air missile (GTAM /dʒɪˈtæm/), is a missile designed to be launched from the ground to destroy aircraft or other missiles. It is one type of antiaircraft system; in modern armed forces, missiles have replaced most other forms of dedicated antiaircraft weapons, with anti-aircraft guns pushed into specialized roles. The first serious attempts at SAM development took place during World War II, although no operational systems were introduced. Further development in the 1940s and 1950s led to the first operational systems being introduced by most major forces during the second half of the 1950s. Smaller systems, suitable for close-range work, evolved through the 1960s and 1970s, to modern systems that are man-portable. Shipborne systems followed the evolution of land-based models, starting with long-range weapons and steadily evolving toward smaller designs to provide a layered defence that have pushed gun-based systems into the shortest-range roles. The American Nike Ajax was the first operational guided missile SAM system, and the Soviet Union's S-75 Dvina was the most-produced SAM. Widely used modern examples include the Patriot and S-300 wide-area systems, SM-6 naval missiles, and short-range man-portable systems like the Stinger and Strela-3. The first known idea for a guided surface-to-air missile was in 1925, when a beam riding system was proposed whereby a rocket would follow a searchlight beam onto a target. A selenium cell was mounted on the tip of each of the rocket's four tail fins, with the cells facing backwards. When one selenium cell was no longer in the light beam, it would be steered in the opposite direction back into the beam. The first historical mention of a concept and design of a surface-to-air missile in which a drawing was presented, was by inventor Gustav Rasmus in 1931, who proposed a design that would home in on the sound of an aircraft's engines. During World War II, efforts were started to develop surface-to-air missiles as it was generally considered that flak was of little use against bombers of ever-increasing performance. The lethal radius of a flak shell is fairly small, and the chance of delivering a "hit" is essentially a fixed percentage per round. In order to attack a target, guns fire continually while the aircraft are in range in order to launch as many shells as possible, increasing the chance that one of these will end up within the lethal range. Against the Boeing B-17, which operated just within the range of the numerous German eighty-eights flak guns, an average of 2,805 rounds had to be fired per bomber destroyed. The first serious consideration of a SAM development project was a series of conversations that took place in Germany during 1941. In February, Friederich Halder proposed a "flak rocket" concept, which led Walter Dornberger to ask Wernher von Braun to prepare a study on a guided missile able to reach between 15,000 and 18,000 m (49,000 and 59,000 ft) altitude. Von Braun became convinced a better solution was a manned rocket interceptor, and said as much to the director of the T-Amt, Roluf Lucht, in July. The directors of the Luftwaffe flak arm were not interested in manned aircraft, and the resulting disagreements between the teams delayed serious consideration of a SAM for two years. Von Axthelm published his concerns in 1942, and the subject saw serious consideration for the first time; initial development programs for liquid- and solid-fuel rockets became part of the Flak Development Program of 1942. By this point serious studies by the Peenemünde team had been prepared, and several rocket designs had been proposed, including 1940's Feuerlilie, and 1941's Wasserfall and Henschel Hs 117 Schmetterling. None of these projects saw any real development until 1943, when the first large-scale raids by the Allied air forces started. As the urgency of the problem grew, new designs were added, including Enzian and Rheintochter, as well as the unguided Taifun which was designed to be launched in waves. In general, these designs could be split into two groups. One set of designs would be boosted to altitude in front of the bombers and then flown towards them on a head-on approach at low speeds comparable to manned aircraft. These designs included the Feuerlilie, Schmetterling and Enzian. The second group were high-speed missiles, typically supersonic, that flew directly towards their targets from below. These included Wasserfall and Rheintochter. Both types used radio control for guidance, either by eye, or by comparing the returns of the missile and target on a single radar screen. Development of all these systems was carried out at the same time, and the war ended before any of them was ready for combat use. The infighting between various groups in the military also delayed development. Some extreme fighter designs, like the Komet and Natter, also overlapped with SAMs in their intended uses. Albert Speer was especially supportive of missile development. In his opinion, had they been consistently developed from the start, the large scale bomber raids of 1944 would have been impossible. Typical of the "boost-glide" type weapons, the Fairey Stooge was an armed drone aircraft flown to a collision with the target. Enzian and Schmetterling were similar in concept, design and performance. The British developed unguided antiaircraft rockets (operated under the name Z Battery) close to the start of World War II, but the air superiority usually held by the Allies meant that the demand for similar weapons was not as acute. When several Allied ships were sunk in 1943 by Henschel Hs 293 glide bombs and Fritz X antiship missiles, Allied interest changed. These weapons were released from stand-off distances, with the bomber remaining outside the range of the ship's antiaircraft guns, and the missiles themselves were too small and fast to be attacked effectively. To combat this threat, the U.S. Navy launched Operation Bumblebee to develop a ramjet-powered missile to destroy the launching aircraft at long range. The initial performance goal was to target an intercept at a horizontal range of 10 miles (16 km) and 30,000 feet (9,100 m) altitude, with a 300 to 600 pound warhead for a 30 to 60 percent kill probability. This weapon did not emerge for 16 years, when it entered operation as the RIM-8 Talos. Heavy shipping losses to kamikaze attacks during the Liberation of the Philippines and the Battle of Okinawa provided additional incentive for guided missile development. This led to the British Fairey Stooge and Brakemine efforts, and the U.S. Navy's SAM-N-2 Lark. The Lark ran into considerable difficulty and it never entered operational use. The end of the war led to the British efforts being used strictly for research and development throughout their lifetime. In the immediate post-war era, SAM developments were under way around the world, with several of these entering service in the early- and mid-1950s. Coming to the same conclusions as the Germans regarding flak, the U.S. Army started its Project Nike developments in 1944. Led by Bell Labs, the Nike Ajax was tested in production form in 1952, becoming the first operational SAM system when it was activated in March 1954. 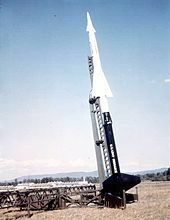 Concerns about Ajax's ability to deal with formations of aircraft led to greatly updated version of the same basic design entered service in 1958 as the Nike Hercules, the first nuclear-armed SAM. The U.S. Army Air Forces had also considered collision-course weapons (like the German radio-controlled concepts) and launched Project Thumper in 1946. This was merged with another project, Wizard, and emerged as the CIM-10 Bomarc in 1959. The Bomarc had a range of over 500 km, but it was quite expensive and somewhat unreliable. Development of Oerlikon's RSD 58 started in 1947, and was a closely held secret until 1955. Early versions of the missile were available for purchase as early as 1952, but never entered operational service. 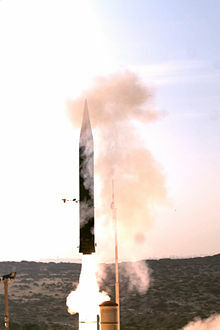 The RSD 58 used beam riding guidance, which has limited performance against high-speed aircraft, as the missile is unable to "lead" the target to a collision point. Examples were purchased by several nations for testing and training purposes, but no operational sales were made. The Soviet Union began development of a SAM system in earnest with the opening of the cold war. Joseph Stalin was worried that Moscow would be subjected to American and British air raids, like those against Berlin, and, in 1951, he demanded that a missile system to counter a 900 bomber raid be built as quickly as possible. This led to the S-25 Berkut system (SA-1 in NATO terminology), which was designed, developed and deployed in a rush program. Early units entered operational service on 7 May 1955, and the entire system ringing Moscow was completely activated by June 1956. The S-25 was a static system, but efforts were also put into a smaller design that would be much more mobile. This emerged in 1957 as the famous S-75 Dvina (SA-2), a portable system, with very high performance, that remained in operation into the 2000s. The Soviet Union remained at the forefront of SAM development throughout its history; and Russia has followed suit. The early British developments with Stooge and Brakemine were successful, but further development was curtailed in the post-war era. These efforts picked up again with the opening of the cold war, following the "Stage Plan" of improving UK air defences with new radars, fighters and missiles. Two competing designs were proposed for "Stage 1", based on common radar and control units, and these emerged as the RAF's Bristol Bloodhound in 1958, and the Army's English Electric Thunderbird in 1959. A third design followed the American Bumblebee efforts in terms of role and timeline, and entered service in 1961 as the Sea Slug. A moment after an S-75 Dvina (SA-2) hits an F-105 over North Vietnam, the fighter-bomber starts to spew flame. 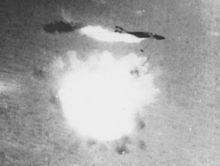 An S-75 detonates directly below an RF-4C reconnaissance plane. The crew ejected and were taken captive. The Vietnam War was the first modern war in which guided antiaircraft missiles seriously challenged highly advanced supersonic jet aircraft. It would also be the first and only time that the latest and most modern air defense technologies of the Soviet Union and the most modern jet fighter planes and bombers of the United States confronted each other in combat. Nearly 17,000 Soviet missile technicians, and operator/instructors deployed to North Vietnam in 1965 to help defend Hanoi against American bombers, while North Vietnamese missilemen completed their six to nine months of SAM training in the Soviet Union. From 1965 through all of 1966, nearly all of the 48 U.S. jet aircraft shot down by SA-2s over North Vietnam were downed by Soviet missile men. During the course of the air defense of North Vietnam in 1966-1967, one Russian SAM operator, Lieutenant Vadim Petrovich Shcherbakov,[nb 2] was credited with destroying 12 U.S. aircraft from 20 engagements. 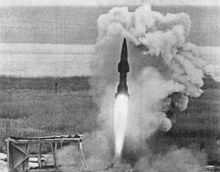 During the war, The Soviet Union supplied 7,658 SAMs to North Vietnam, and their defense forces conducted about 5,800 launches, usually in multiples of three. By the war's end, the U.S lost 3,374 aircraft in combat. 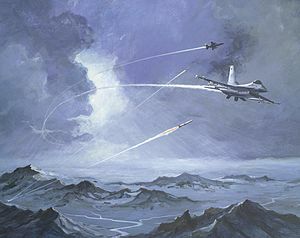 According to the Vietnamese, 31% were shot down by SA-2 missiles (1,046 aircraft, or 6 missiles per one kill); 60% were shot down by anti-aircraft guns; and 9% were shot down by MiG fighter However, U.S confirmed only 205 aircraft had been lost to North Vietnamese surface-to-air missiles. Many of the U.S aircraft "crashed in flight accidents", in fact, were crashed due to S-75 missiles. When landing at an airfield in Thailand, one B-52 was heavily damaged by SAM, rolled out of the runway and blown up on mines installed around the airfield to protect the guerrillas, only one crewman survived. Subsequently, this B-52 was counted as "crashed in flight accidents". The Osa was the first system to include search, track and missiles all on a single mobile platform. All of these early systems were "heavyweight" designs with limited mobility and requiring considerable set-up time. However, they were also increasingly effective. By the early 1960s, the deployment of SAMs had rendered high-speed high-altitude flight in combat practically suicidal. [nb 3] The way to avoid this was to fly lower, below the line-of-sight of missile's radar systems. This demanded very different aircraft, like the F-111, TSR-2, and Panavia Tornado. As a result, SAMs evolved rapidly in the 1960s. As their targets were now being forced to fly lower due to the presence of the larger missiles, engagements would necessarily be at short ranges, and occur quickly. Shorter ranges meant the missiles could be much smaller, which aided them in terms of mobility. By the mid-1960s, almost all modern armed forces had short-range missiles mounted on trucks or light armour that could move with the armed forces they protected. Examples include the 2K12 Kub (SA-6) and 9K33 Osa (SA-8), MIM-23 Hawk, Rapier, Roland and Crotale. The introduction of sea-skimming missiles in the late 1960s and 1970s led to additional mid- and short-range designs for defence against these targets. The UK's Sea Cat was an early example that was designed specifically to replace the Bofors 40 mm gun on its mount, and became the first operational point-defense SAM. The American RIM-7 Sea Sparrow quickly proliferated into a wide variety of designs fielded by most navies. Many of these are adapted from earlier mobile designs, but the special needs of the naval role has resulted in the continued existence of many custom missiles. The Strela-2 was an early and widespread MANPADs system. Starstreak laser-guided surface-to-air missile of the British Army. As aircraft moved ever lower, and missile performance continued to improve, eventually it became possible to build an effective man-portable anti-aircraft missile. Known as MANPADS, the first example was a Royal Navy system known as the Holman Projector, used as a last-ditch weapon on smaller ships. The Germans also produced a similar short-range weapon known as Fliegerfaust, but it entered operation only on a very limited scale. The performance gap between this weapon and jet fighters of the post-war era was so great that such designs would not be effective. By the 1960s, technology had closed this gap to a degree, leading to the introduction of the FIM-43 Redeye, SA-7 Grail and Blowpipe. Rapid improvement in the 1980s led to second generation designs, like the FIM-92 Stinger, 9K34 Strela-3 (SA-14) and Starstreak, with dramatically improved performance. By the 1990s to the 2010s, the Chinese had developed designs drawing influence from these, notably the FN-6. Through the evolution of SAMs, improvements were also being made to anti-aircraft artillery, but the missiles pushed them into ever shorter-range roles. By the 1980s, the only remaining widespread use was point-defense of airfields and ships, especially against cruise missiles. By the 1990s, even these roles were being encroached on by new MANPADS and similar short-range weapons, like the RIM-116 Rolling Airframe Missile. Surface-to-air missiles are classified by their guidance, mobility, altitude and range. Missiles able to fly longer distances are generally heavier, and therefore less mobile. This leads to three "natural" classes of SAM systems; heavy long-range systems that are fixed or semi-mobile, medium-range vehicle-mounted systems that can fire on the move, and short-range man-portable air-defense systems (MANPADS). The David's Sling Stunner missile is designed for super-maneuverability. A three-pulse motor activates only during the kill-stage, providing additional acceleration and maneuverability. Modern long-range weapons include the Patriot and S-300 (missile) systems, which have effective ranges on the order of 150 km, and offer relatively good mobility and short unlimbering times. These compare with older systems with similar or less range, like the MIM-14 Nike Hercules or S-75 Dvina, which required fixed sites of considerable size. Much of this performance increase is due to improved rocket fuels and ever-smaller electronics in the guidance systems. Some very long-range systems remain, notably the Russian S-400, which has a range of 400 km. Medium-range designs, like the Rapier and 2K12 Kub, are specifically designed to be highly mobile with very fast, or zero, setup times. Many of these designs were mounted on armoured vehicles, allowing them to keep pace with mobile operations in a conventional war. Once a major group onto itself, medium-range designs have seen less development since the 1990s, as the focus has changed to unconventional warfare. Developments have also been made in onboard maneuverability. Israel's David's Sling Stunner missile is designed to intercept the newest generation of tactical ballistic missiles at low altitude. The multi-stage interceptor consists of a solid-fuel, rocket motor booster, followed by an asymmetrical kill vehicle with advanced steering for super-maneuverability during the kill-stage. A three-pulse motor provides additional acceleration and maneuverability during the terminal phase. MANPAD systems first developed in the 1960s and proved themselves in battle during the 1970s. MANPADs normally have ranges on the order of 3 km and are effective against attack helicopters and aircraft making ground attacks. Against fixed wing aircraft, they can be very effective, forcing them to fly outside the missile's envelope and thereby greatly reducing their effectiveness in ground-attack roles. MANPAD systems are sometimes used with vehicle mounts to improve maneuverability, like the Avenger system. These systems have encroached on the performance niche formerly filled by dedicated mid-range systems. Ship-based anti-aircraft missiles are also considered to be SAMs, although in practice it is expected that they would be more widely used against sea skimming missiles rather than aircraft. Virtually all surface warships can be armed with SAMs, and naval SAMs are a necessity for all front-line surface warships. Some warship types specialize in anti-air warfare e.g. Ticonderoga-class cruisers equipped with the Aegis combat system or Kirov class cruisers with the S-300PMU Favorite missile system. Modern Warships may carry all three types (from long-range to short-range) of SAMs as a part of their multi-layered air defence. SAM systems generally fall into two broad groups based on their guidance systems, those using radar and those using some other means. Longer range missiles generally use radar for early detection and guidance. Early SAM systems generally used tracking radars and fed guidance information to the missile using radio control concepts, referred to in the field as command guidance. Through the 1960s, the semi-active radar homing (SARH) concept became much more common. In SARH, the reflections of the tracking radar's broadcasts are picked up by a receiver in the missile, which homes in on this signal. SARH has the advantage of leaving most of the equipment on the ground, while also eliminating the need for the ground station to communicate with the missile after launch. Smaller missiles, especially MANPADs, generally use infrared homing guidance systems. These have the advantage of being "fire-and-forget", once launched they will home on the target on their own with no external signals needed. In comparison, SARH systems require the tracking radar to illuminate the target, which may require them to be exposed through the attack. Systems combining an infrared seeker as a terminal guidance system on a missile using SARH are also known, like the MIM-46 Mauler, but these are generally rare. Some newer short-range systems use a variation of the SARH technique, but based on laser illumination instead of radar. These have the advantage of being small and very fast acting, as well as highly accurate. A few older designs use purely optical tracking and command guidance, perhaps the best known example of this is the British Rapier system, which was initially an all-optical system with high accuracy. All SAM systems from the smallest to the largest generally include identified as friend or foe (IFF) systems to help identify the target before being engaged. While IFF is not as important with MANPADs, as the target is almost always visually identified prior to launch, most modern MANPADs do include it. A JASDF soldier uses the optical sight on the Type 91 Kai MANPAD to acquire a mock airborne target. The prominent vertical metal devices on the left are the IFF antennas. A U.S. Marine antiaircraft gunner aims his Stinger at a location indicated by a spotter. Long-range systems generally use radar systems for target detection, and depending on the generation of system, may "hand off" to a separate tracking radar for attack. Short range systems are more likely to be entirely visual for detection. Hybrid systems are also common. The MIM-72 Chaparral was fired optically, but normally operated with a short range early warning radar that displayed targets to the operator. This radar, the FAAR, was taken into the field with a Gama Goat and set up behind the lines. Information was passed to the Chaparral via a data link. Likewise, the UK's Rapier system included a simple radar that displayed the rough direction of a target on a series of lamps arranged in a circle. The missile operator would point his telescope in that rough direction and then hunt for the target visually. Suppression of Enemy Air Defenses (SEAD), the mission of finding and destroying SAM and AA gun installations. The SEAD mission in the United States Air Force is designated "Wild Weasel". ^ This is a quote-of-a-quote and the original source is not available. Axthelm almost certainly stated these numbers in metric terms. ^ The introduction of effective SAMs led to the cancellation of the B-70 bomber, and the prohibition of manned recce flights over the Soviet Union. Even aircraft with extreme performance, like the SR-71, were hit by SAMs on occasions. ^ "Evolution of the Guided Missile" FLIGHT, May 4, 1951, p. 535. ^ Corporation, Bonnier (1 July 1931). "Popular Science". Bonnier Corporation – via Google Books. ^ a b Westerman 2001, p. 111. ^ Westerman 2001, p. 78. ^ Westerman 2001, p. 112. ^ Albert Speer, "Inside the Third Reich", Macmillan, p. 492. ^ a b c "A Brief History of White Sands Proving Ground 1941–1965" (PDF). New Mexico State University. Archived from the original (PDF) on 2014-10-28. Retrieved 2010-08-19. ^ "Talos Missile History". Hays, Philip R. Retrieved 2010-08-19. ^ Phillip Hays, "History of the Talos Missile"
^ "Swiss Guided Missile" Flight, 7 January 1955, p. 7. ^ "Guided Missiles", FLIGHT, 7 December 1956, p. 910. ^ Bill Gunston, Rockets & Missiles, Salamander Books, 1979, p. 156. ^ The Illustrated Encyclopedia of 20th Century Weapons and Warfare Vol. 11, pp. 1175–1176, general editor Bernard Fitzsimons, Purnell & Sons Ltd. 1967/68. ^ "Bloodhound: The SAGW System of the Royal Air Force. ", Flight International, 23 October 1959, pp. 431–438. ^ "Thunderbird", Flight International, 25 September 1959, pp. 295–299, 302–303. ^ Artofwar. Ьекнлшрнб Цеммюдхи Ъйнбкебхв. Бяе Явхрюкх, Врн Рюйнцн Ме Лнцкн Ашрэ Мхйнцдю. Artofwar.ru. Retrieved on 2013-09-18. ^ Українська Спілка ветеранів Афганістану (воїнів-інтернаціоналістів) – Вьетнам. Как это было. Usva.org.ua. Retrieved on 2013-09-18. ^ "SEACAT – The Guided Missile To Defend Small Ships", Flight International, 5 September 1963, p. 438. Davies, Peter. F-105 Wild Weasel vs SA-2 "guideline" SAM, Vietnam 1965–73. Osprey 2011. ISBN 978-1-84908-471-0. Hobson, Chris. Vietnam Air Losses, United States Air Force, Navy, and Marine Corps Fixed-Wing Aircraft Losses in Southeast Asia 1961–1973. Midland Publishing 2001. ISBN 1-85780-115-6. Westerman, Edward (2001). Flak: German Anti-Aircraft Defenses, 1914–1945. University Press of Kansas. ISBN 0700614206. Wikisource has several original texts related to: Audio recordings and transcripts of Wild Weasel missions flown during the Vietnam War, including attacks on SAM sites.